by Liang Heng, Judith Shapiro | Biographies & Memoirs | This book has not been rated. Found this at the meet-up tonight. It has never been registered, so I am registering it. Am looking forward to reading this. From the back cover: "Liang Heng was born in 1954 in Changsha, a large city in Central China. His parents were intellectuals - his father a reporter on a major provincial newspaper, his mother a ranking cadre in the local police. This is Liang Heng's own story of growing up in the turmoil of the Great Cultural Revolution. His story is unique, but at the same time it is in many ways typical of those millions of young Chinese who have been tested almost beyond endurance in recent years. In his words we hear an entire generation speaking." 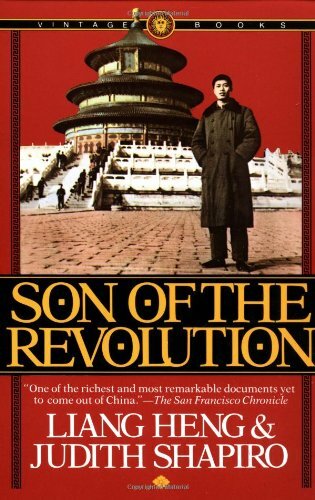 This is about the fifth book I have read of the Cultural Revolution in China. This one goes into a great deal of detail and describes how people's lives were impacted negatively. All of the books I have read describe similar events and happenings. As well, I know someone personally who lived through this period in China and who now lives in North America. She has confirmed so much of what I have read. Liang Heng has written a fantastic account of this time in China and of how it affected his life and that of his family. I think everyone should read this book. I am reserving this for my Family Members Virtual Bookbox.